Imagine the thrill your child will have as she writes and records two original songs with her new bandmates in a professional recording studio. This is exactly what our summer music camp provides, even if she has never played or sang a note in her entire life! This video is from a song written and recorded by our students in a past summer camp. It was also storyboarded and shot by these young musicians – all within just one week! See more videos from our past summer camps. Our music camps are very different from other summer camps. When kids come to one of our camps, they learn to work on something they enjoy – something that is truly their own. And they grow while being surrounded by dynamic, talented teachers and friends. have a blast as they create their own original music in a professional recording studio while making many new friends. grow in confidence while developing their creative, collaborative, and communication skills. learn to overcome shyness and fear of failure as they share and express their own ideas while writing songs. 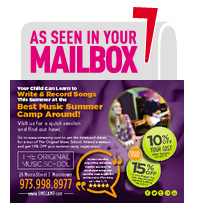 Whether your child is new to music or an aspiring recording artist, our camps will meet his or her needs. Please see our camp packages for more information.